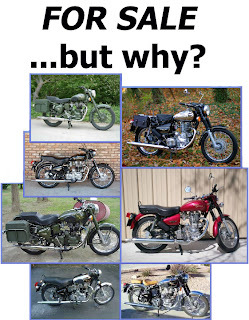 Why do owners sell their Royal Enfields? Royal Enfield guru Pete Snidal recently spotted something about the motorcycles shown for sale here on this blog. "I notice one thing all the Bullets for sale seem to have in common - can you guess what it is?" he wrote me. Pete is the author of the acclaimed Royal Enfield Bullet owner's and workshop manual. He frequently chimes in on the Royal Enfield Yahoo message board to help troubleshoot problems owners experience. But what could he possibly be seeing in the for-sale ads? "Look at all their exhaust systems. Something I discovered very early in life with Brit singles is that they became completely different machines with free-flowing (i.e., loud, requiring using your head about where and when to apply large gobs of throttle) exhaust systems. And that they were much less satisfactory when stock. "An exception was the Velocettes with that monster Brooklands silencer, and the Goldstars, which already came with noisy mufflers. Some AJS/Matchless, too. "My theory is that the owners who never 'bothered' with the first-stage mods, i.e., inlet and exhaust mods, just fell into the doldrums with their Bullets, and ended up putting them on the market. If you wonder, try putting your stock exhaust back on, and see for yourself. Snidal was seeing the big, bazooka shaped factory muffler, which restricts performance, in the pictures of the bikes. Replacing it with a shorter and nosier silencer (and tuning appropriately) is an easy way to increase performance. As Snidal observes, that makes for more owner satisfaction. Big factory silencer affects performance. if the company focuses more on reliability,things will be great. @vinay Absolutely agree with u mate ! !